We'll use this entry to follow-up on John Pudner's post from a few days ago where he looked at the Providence game and Marquette down the stretch. As he pointed out, Ken Pomeroy predicts that we'll finish 11-7 down the stretch (20-10 overall). This could possibly leave Marquette finishing as high as 4th in the BIG EAST this year. However, I wanted to run the predictions through my own model and, if nothing else, put up some sensitivities on the likelihood of finishing in-line with that Pomeroy assessment. First, how do our predictions (as of today's team) compare to Pomeroy's? We highlighted in green (favorable) and red (unfavorable) where there are disconnects between Pomeroy's predictions and our predictions. For one, our model views life on the road as being a little bit trickier than Pomeroy does. Where he has Marquette as a favorite on the road at UC, SJU, and SHU, we have the good guys as underdogs against Cincy and Seton Hall, and then just about a toss up on the road at St. Johns. We also have Marquette as a stronger favorite against Pitt than he does, and the rest of the predictions are pretty close. Given that we are a bit more bearish than Pomeroy, what does the analysis give for sensitivity of the final W-L record? We're calculating a most likely view of 10 wins in conference, meaning that Marquette's most likely scenario is to finish 4-3 in the final seven regular season games. But here's your additional dose of optimism for these scenarios. If you had told me (anybody?) before the start of the season there was a 90% chance of finishing 0.500 or better, I'd have laughed in your face. Now is a final conference record of 10-8 (overall 19-11) good enough for a trip to the NCAA tournament? Maybe, and maybe not, but it is close enough that a win or two in the BET would get us there. Buckle up down the stretch and get ready for the final run of the season. We'll have more on South Florida and that 84% chance of victory tomorrow. Thanks, Rob. Great insight, as always. Despite what the numbers say, I have a tough time wrapping my head around MU being favorites in games against Pitt, Louisville, and Notre Dame, while being underdogs against Cincy, St. John's, and Seton Hall. Just seems odd to consider that, but we'll watch and see. So impressed with this season so far, I'm excited to see how it finishes. I agree Matt. Louisville will always be a tough game for MU in my opinion. Both ND and Pitt have a lot talent in places that MU lacks, so those will be two tough Big East battles as well. While I'm less concerned with Cincy, Seton Hall and St. John's, MU has been known to play down to these teams, and they are certainly much stronger this year than in the years past. Unfortunately, our loss to DePaul only shows how we can lose to any team in the BE. St. John's crushed Lousville last night, and that makes me a little weary about this closing stretch, but as always I'll hope for MU victories! Guys, thanks for the feedback. Basically, it boils down to two things. 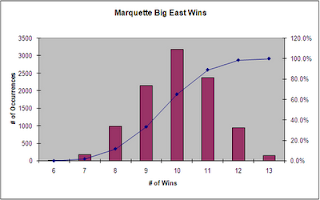 #1 - Believe it or not, Marquette is a very good offensive team, mostly due to exceptional three point shooting. #2 - Life is hard on the road, and homecourt advantage counts for a lot. The rims are softer at the BC and tighter elsewhere.